Today is the birthday of Alvin M. Hemrich (February 14, 1870-February 25, 1935). He was born in Wisconsin, of German-born parents, and from age 18 began working in breweries. In 1891, he moved to the Seattle, Washington area, and began working for breweries there and in Canada, including the Seattle Brewing & Malting Co. His brother Andrew bought the Bay View Brewery in Seattle, and later Alvin bought the North Pacific Brewery (also known as the old Slorah brewery), and renamed it the Alvin Hemrich Brewing Co. in 1897. Two of his brothers soon joined him in the enterprise, and it was renamed again, this time to Hemrich Brothers Brewing Company. 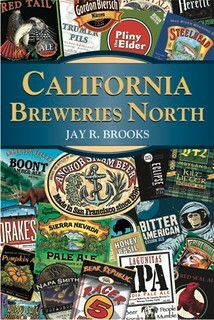 They did well enough that he began buying out other area breweries. 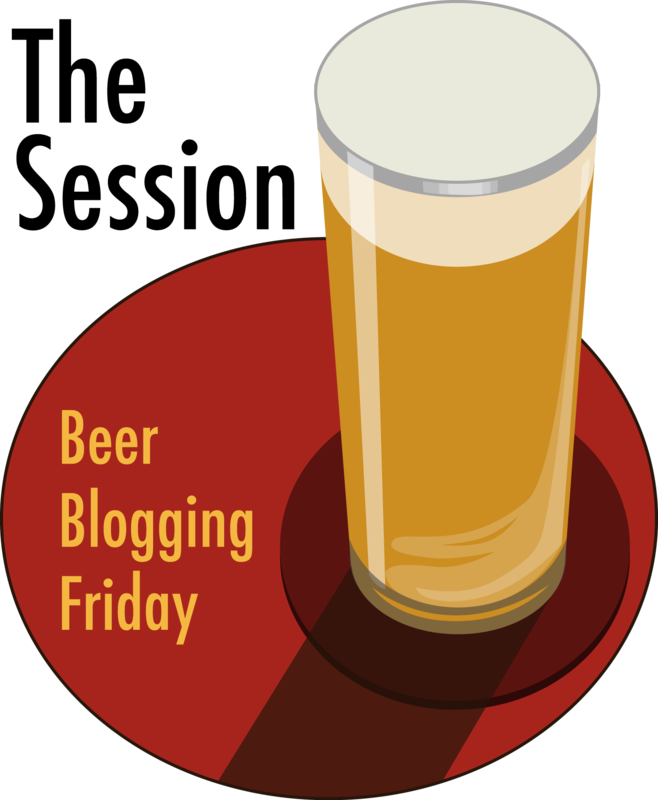 When prohibition closed the brewery, they were ready, having retooled their plants for near-beer and also having divested into some other businesses. They reopened when prohibition was repealed, and two of Alvin’s sons went into the family business, too, but their father died just two years later. Alvin M. Hemrich and his eldest son, Elmer, around 1910. 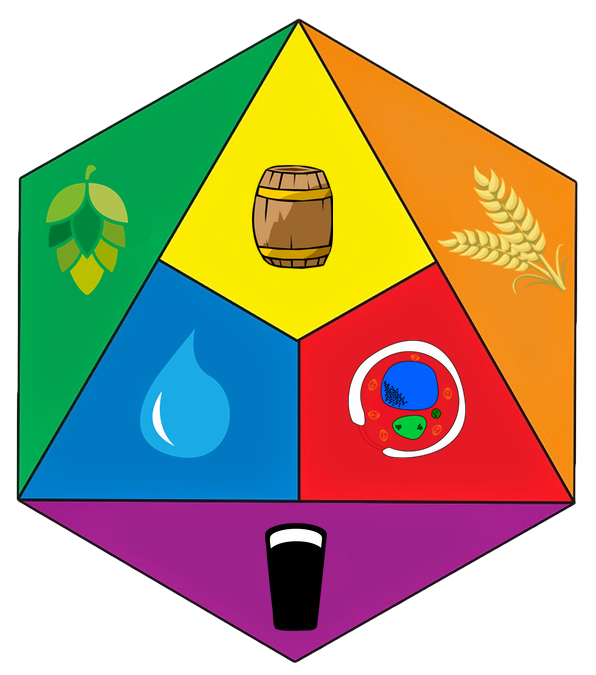 As is typical for Pacific Northwest breweries, Gary Flynn has a thorough biography culled from numerous sources at his Brewery Gems website. 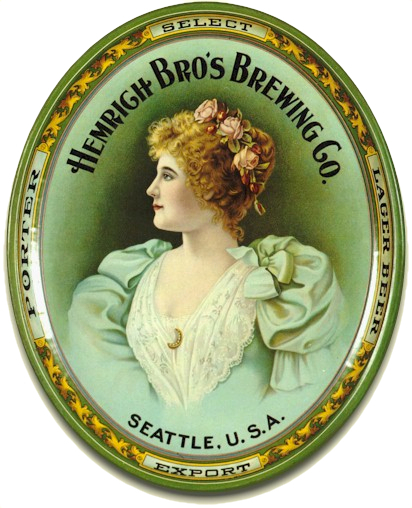 Hemrich Brothers Brewing around 1900. It was in 1883 that Andrew Hemrich (b. 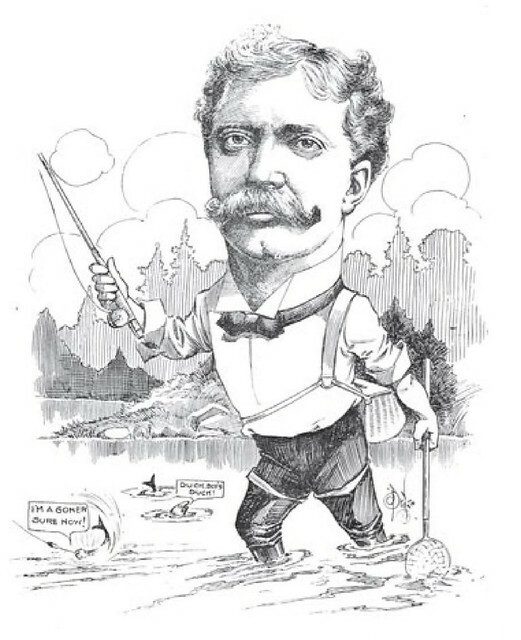 1856) and John Kopp arrived in Seattle where they acquired a parcel of land right below Seattle’s Beacon Hill that boasted a cool, freshwater spring. It was there — just south of Seattle’s downtown (at Hanford Street — and 9th Avenue S, today’s Airport Way S) — that they constructed a small brewing facility. 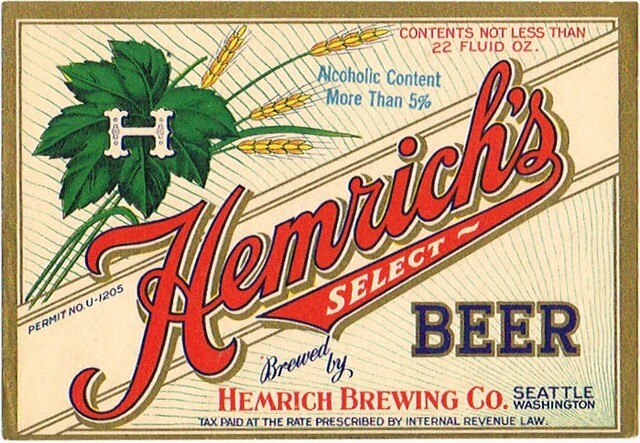 Hemrich was the son of a German brewmaster who’d run a brewery in Wisconsin in the 1850s and he’d opened his own brewery in Glendale, Montana, where he met Kopp, a local baker. Once settled in Seattle, the Kopp & Hemrich company began brewing a “steam” beer and soon branched out with a lager style. Business was good: More than 2,600 barrels of beer were sold that debut year. Increasingly impressed by the beautiful view of Elliott Bay seen from the brewery, the men renamed their operation the Bay View Brewing Company in 1885. Steady growth in business caused the firm to construct a new and vastly larger plant in 1887. At that time the waters of Duwamish delta still lapped the slopes of Beacon Hill, and the narrow-gauge Grant Street Railway (Seattle’s first “interurban” line) rode above the tideflats on a trestle along the future route of Airport Way. Hemrich erected his mansion above the brewery, in the middle of the future right-of-way for I-5. The brew crew at Hemrich Brothers, with Alvin front left. Practical industry wisely and vigorously applied never fails of success. 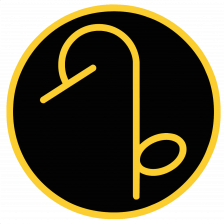 It carries a man onward and upward, brings out his individual character and powerfully stimulates the actions of others. It is this unflagging spirit of industry that has laid the foundations and built the commercial greatness of the northwest, and the career of him whose name initiates this paragraph illustrates most forcibly the possibilities that are open to a young man who possesses sterling business qualifications, and it proves that ambitious perseverance, steadfast purpose and indefatigable industry, as combined with the observance of sound business principles, will eventuate in the attaining of a definite and worthy success. Mr. Hemrich, who is president and manager of the Hemrich Brothers Brewing Company, an important industrial enterprise in the city of Seattle, is a young man of singular force of character and one who stands representative of that insistent and well directed energy which has brought about the development of the magnificent metropolis of the northwest. That he should be accorded specific mention in a work of this nature needs not be said. Alvin M. Hemrich was born in the town of Alma, Buffalo county, Wisconsin, on the 14th of February, 1870, a son of John and Catherine (Koeppel) Hemrich, both of whom were born in Germany. The father was for many years engaged in the brewing business at Alma, Wisconsin, and he was seventy-three years old when he died, while his wife is still living. Alvin passed his boyhood days in Wisconsin and secured his early educational discipline in the public schools. At the age of sixteen he assumed charge of the business founded by his father in Alma and conducted the same for two years, becoming thoroughly familiar with all details pertaining thereto. 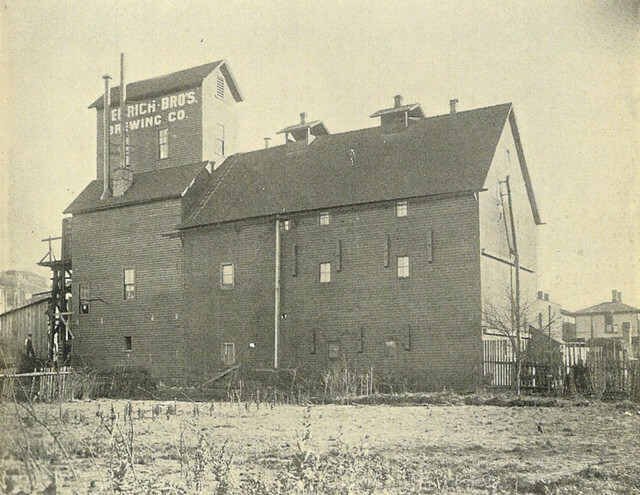 At the expiration of the period noted he engaged in the brewing business on his own responsibility in the town of Durand, Wisconsin, and there he successfully continued operations until the year 1890, when he disposed of his interests and came to Seattle, where his parents had located some time previously. After his arrival in Washington Mr. Hemrich proceeded to Victoria, British Columbia, where for two years he held the position of manager of the Victoria Brewing Company. He then returned to Seattle and became foreman for the Albert Braun Brewing Association, retaining this incumbency one year, when the business was closed out, and he then took a similar position with the Bay View Brewing Association, in whose employ he continued for four years, being finally compelled to resign by reason of failing health, and he then passed some time in travel, principally in California. After recuperating his energies through this period of rest and recreation Mr. Hemrich returned to Seattle and here purchased the plant and business of the old Slorah brewery, located on Howard avenue, between Republican and Mercer streets, and there he conducted business for six months, at the expiration of which he became associated with his brother Louis of whom mention is made on another page, and with Julius Damus, in the organization of the Hemrich Brothers Brewing Company, which was duly incorporated under the laws of the state on the 4th of February, 1899, and under the effective management of these interested principals the business has been built up to a most successful standpoint, the equipment of the plant being of the most approved modern type, while every detail of manufacture receives the most careful and discriminating attention of the part of our subject and his brother, both of whom are experts in this line of industry. 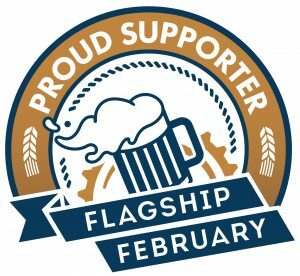 The result is that the products of the brewery, including lager and porter, are of exceptional excellence, thus gaining a popularity which augurs for the increasing expansion and growth of the business. 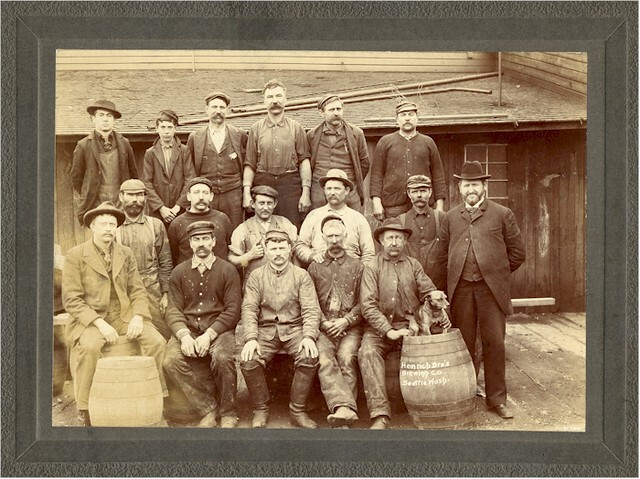 From the brewery are sent forth each year about thirty-five thousand barrels, and in the prosecution of the business in its various departments employment is afforded to a corps of about seventy-five capable workmen. None but the best material is utilized in the process of manufacture, the malt being secured from Wisconsin and California, and the hops being the most select products from Bohemia and from the state of Washington, whose prestige in this line is well known. The present company have made important changes in the equipment of the plant, having installed the latest improved accessories and having greatly augmented the productive capacity. Alvin M. Hemrich has been president of the company from the time of its organization, and the success of the enterprise is in large measure due to his able and well directed efforts. In November, 1901, Mr. Hemrich effected the purchase of the property of the Aberdeen Brewing Company at Aberdeen, this state, and he began the operation of the plant shortly afterward, having organized a stock company, which was incorporated with a capital stock of sixty thousand dollars, he himself being president of the company. Mr. Hemrich is well and most favorably known in connection with the business activities of the city of Seattle, and is esteemed as a straightforward, capable business man. He has made judicious investments in local real estate and is one of the most loyal admirers and enthusiastic citizens of his adopted city. His beautiful residence, which he erected in 1898, is located at 503 Melrose avenue, and is one of the most attractive of the many fine homes for which Seattle is justly noted. Fraternally Mr. Hemrich is identified with the Sons of Hermann, the Independent Order of Odd Fellows, the Fraternal Order of Eagles, the Red Men, and the Benevolent and Protective Order of Elks, while his wife is a member of the Rebekah lodge of the Odd Fellows. Mr. Hemrich enjoys marked popularity in both business and social circles, being a man of genial presence and unfailing courtesy in all the relations of life, and his home is one in which a refined hospitality is ever in distinctive evidence. On the 8th of May, 1890, Mr. Hemrich was united in marriage to Miss Minnie Rutschow, who was born in Germany, being the daughter of Charles and Minnie (Benecke) Rutschow, both of whom were born in Prussia. Mr. and Mrs. Hemrich have two sons, Elmer E. and Andrew L.